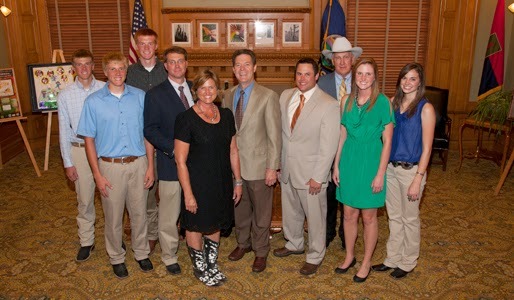 Meeting with the Kansas governor and Secretary of Ag for the presentation of National Farm Mom of the Year. My kids don't have to give me any Mother's Day gifts for the rest of their lives--they went over and above in 2012 for Mother's Day by nominating me for National Farm Mom of the Year. But...they still find a way to thrill me on Mother's Day!! This year they knew I was wanting another purple martin bird house, and they got fired up to build a couple of them for me! My daughter Allie took a lot of teasing a few years ago when she took all semester to build a purple martin house to perfect specifications in woodworking class. She thought it was a bit rough looking and apologized for it. But we mounted it at the specified height that spring and amazingly, we had purple martins the first year! My grandmother in Ohio had a few martin houses and she loved hearing the birds chirping. They have a very unique sound and eat bugs! They also like people, but they have very specific tastes in houses. I have been told that it is hard to attract purple martins. Some people wait years to get the first martins to their new house. You must keep the sparrows and other birds from invading the house before the martins arrive. My boys were doing just that--with a 20-gauge shotgun--until I told them the birds they had lined up dead on the porch were all PURPLE MARTINS!! I figured the rest would leave and never come back. They would spread the word of the horrible nasty place we had--and no bird would come here! And they got two newly built houses mounted tonight! And now we will see if the birds like the new houses! I'll keep you posted!